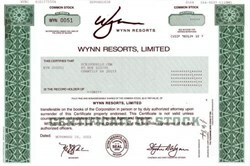 Beautifully engraved uncancelled stock certificate from the Wynn Resorts, Limited. This historic document was printed by the Security-Columbian United States Banknote Company and has an ornate border around it with a vignette of the company logo. This item has the printed signatures of the Company’s Chairman and Chief Executive Officer ( Steve Wynn ) and Secretary. Note the low number of this certificate....under 75. Wynn Resorts is headed by casino mogul Steve Wynn, who is behind such other Vegas landmarks as the Mirage and Bellagio. The company is developing Le Rêve ("The Dream"), a $2.4 billion resort and casino, on the site of the former Desert Inn on the Las Vegas Strip. Le Rêve, which broke ground in 2002 and is slated to open in 2005, will boast a 2,400-room hotel, a casino with 2000 slots and 120 tables, 18 restaurants, an 18-hole golf course, an art gallery (from Wynn's own private collection), two wedding chapels, and a Ferrari and Maserati dealership. Wynn Resorts is also in negotiations with the government of Macau to build one or more casinos there. Chairman Wynn owns 33% of the company. The company went public on Oct 25, 2002. Stephen Alan Wynn (born January 27, 1942) is an American real estate businessman and art collector. He is known for his involvement in the American luxury casino and hotel industry. Early in his career he oversaw the construction and operation of several notable Las Vegas and Atlantic City hotels, including the Golden Nugget, the Golden Nugget Atlantic City, The Mirage, Treasure Island, the Bellagio, and Beau Rivage in Mississippi, and he played a pivotal role in the resurgence and expansion of the Las Vegas Strip in the 1990s. 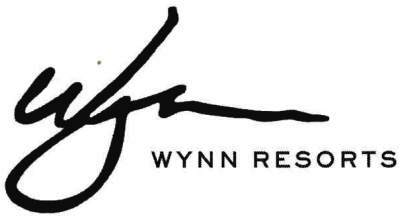 In 2000, Wynn sold his company, Mirage Resorts, to MGM Grand Inc., resulting in the formation of MGM Mirage (now MGM Resorts International). Wynn later took his company Wynn Resorts public in an initial public offering, and was Wynn Resorts' CEO and Chairman of the Board until February 6th, 2018, when he announced his resignation. He is a prominent donor to the Republican Party, and was the finance chair of the Republican National Committee from January 2017 to January 2018, when he resigned amid sexual misconduct allegations. Through Wynn Resorts, he has overseen the construction and development of several luxury resorts, opening Wynn Las Vegas in 2005, Wynn Macau in 2006, Encore Las Vegas in 2008, Encore at Wynn Macau in 2010 and Wynn Palace in Macau in 2016. Current projects include Wynn Everett near Boston. In 2006, Wynn was inducted into the American Gaming Association Hall of Fame. As of September 2015, Wynn's net worth was estimated by Forbes at $2.4 billion, making him the 279th wealthiest American. Steve Wynn collects fine art, often exhibiting pieces by artists such as Picasso and Claude Monet in Wynn Resorts' hotels. In 2018, Wynn was accused by dozens of people of sexual misconduct; he denies the allegations. Wynn stepped down as CEO of Wynn Resorts on February 6, 2018 because of these allegations.